Snail White Whipp Soap Review | Badudets Everything Nice! 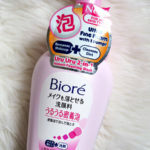 There’s another trending whitening soap to try just because it’s Kris Aquino’s favorite soap. It was shown in one of her house tour videos last December 2017 and she bought the soaps from Thailand. But beauty junkies, rejoice! 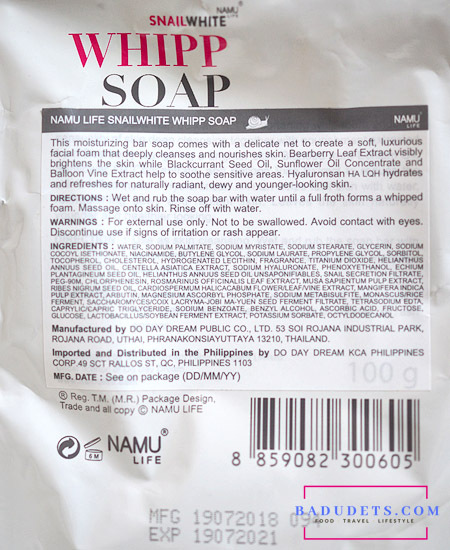 Because Namu Life’s Snail White Whipp Soap is now available in the Philippines. They have an official store in Lazada and Beauty MNL but it will soon be available in Watsons. 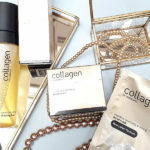 Bearberry Leaf Extracts to brighten the skin. Blackcurrant Seed Oil, Sunflower Oil Concentrate and Balloon Vine Extract to reduce the skin’s inflammation. Hyaluronsan HA LQH hydrates and refreshes for naturally radiant, dewy, and younger looking skin. Now, time to try the bar soap. 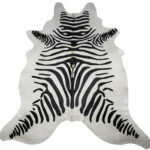 As you can see from the photo, it comes in a net. Don’t remove the soap, the net is there to help in producing the whipped foam, hence the name Whipp (well, that’s just my guess :p). Wet the bar soap and rub until foam appears. 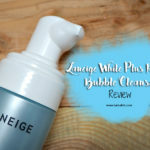 Use the foam to cleanse and massage your face. I like that it comes in a net, that means “matipid” sya gamitin because you’ll just wet the soap and get its foam. What I did is I hang the soap instead of putting it in a soap dish. I love how my skin feels clean and oil-free. With Snail White Whipp soap, skin feels soft and not dry, I don’t oil up for hours unlike with other moisturizing cleansers/facial wash.
One thing I dislike is that it’s heavily scented, as in once you enter the bathroom, you’ll smell the soap. It’s a floral scent and if you’re sensitive with scents, you’ve been warned :p.
No breakouts after using this twice a day for 4 days. I’ll be using this Whipp soap and will update this post if some brightening or whitening is noticed. 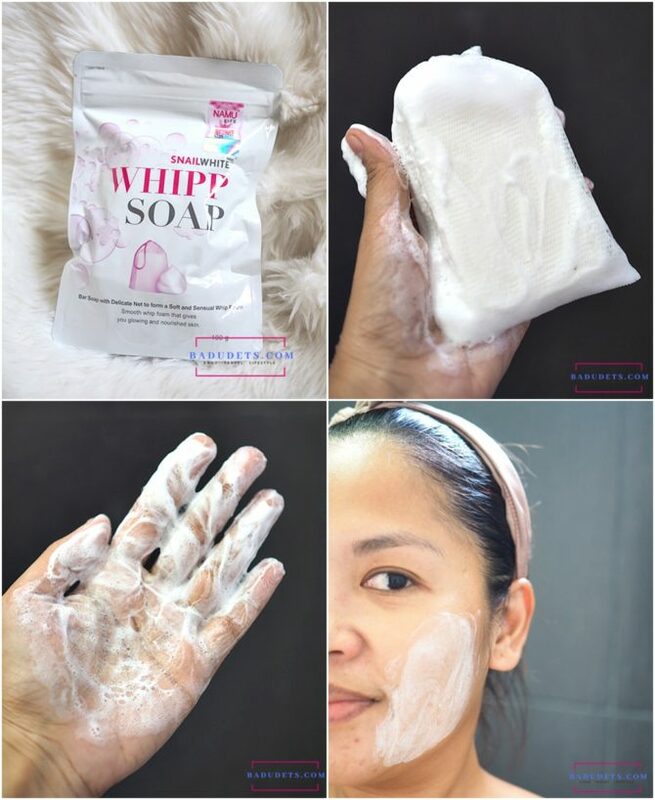 Snail White Whipp Soap is Php 295 in Beauty MNL, price is reasonable considering how very little “foam” is needed for the face. I think 1 bar can last for a month. This soap is popular in online stores before having a local Philippine distributor. 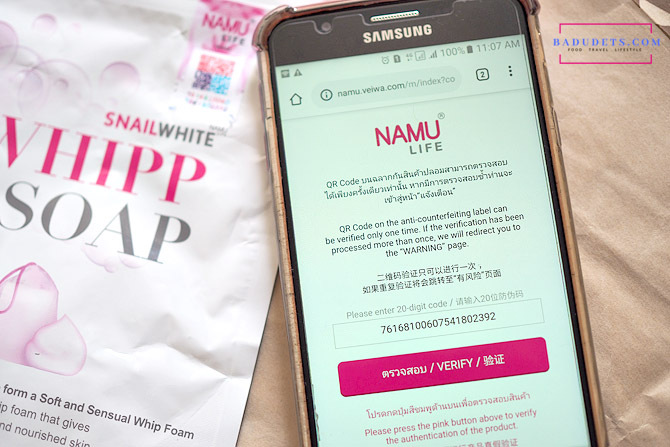 To ensure that you’re buying the authentic Snail White Whipp Soap, Snail White products come with an anti-counterfeit sticker. Scratch the silver part and scan the QR code using your phone. Click Verify. If authentic, the message “Thank you for choosing Namu Life” message will appear. If you got a fake Snail White product, an “alert” message will appear. An alert message will also appear if you verified the product twice. Hi ask ko lang po saan site ako punta para macheck or ma scan if fake or legit ung nabili ko na snail white whipp soap? Sa packaging po may QR code dun, using a QR scanner (just download an app sa phone nyo). Scan nyo lang yung QR code, mapupunta na kayo sa site to check if authentic.